I heart buying shoes, but getting them at a steel of a deal makes them even better. Want to SEE the shoes! Hey, we have a friend in common. Bev? 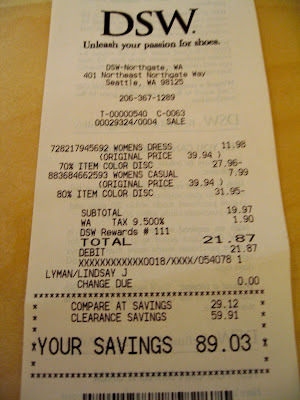 Anyway, I saw this post of your DSW receipt AND the pic of you flipping the bird. I think we are destined to be friends! You're hilarious! I hope the shoes are gorgeous!